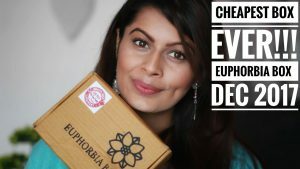 Today I am posting a review which I wrote when I was around 7 months pregnant. My baby 👶is 10 months old now, I am really surprised 🙀that I forgot it completely. 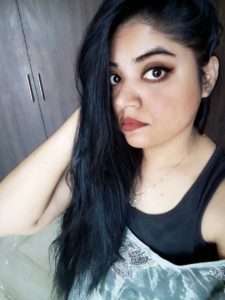 To be honest I was really confused that I should published it not but finally decided to make it alive on my blog. 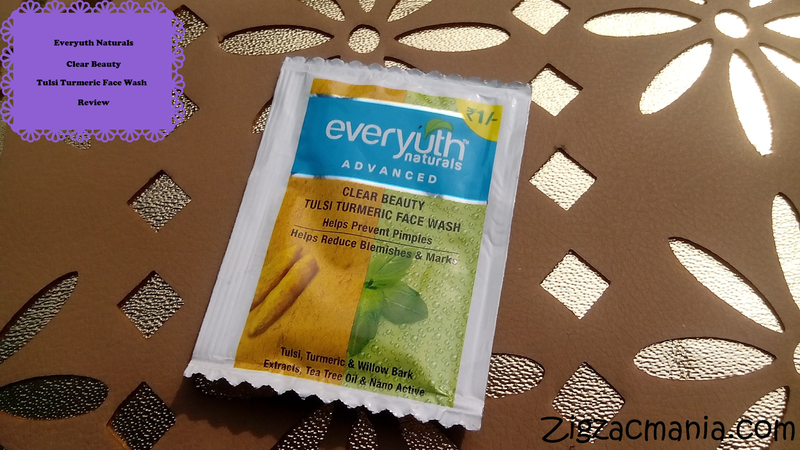 So do scroll down do read my complete review about Everyuth Naturals Clear Beauty Tulsi Turmeric Face Wash. 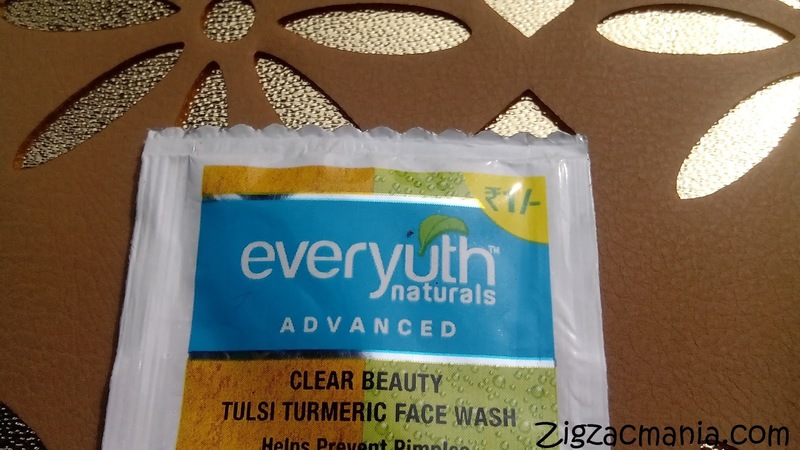 Product claims: Everyuth Naturals Clear Beauty Tulsi Turmeric Face Wash not only helps prevent pimples but also reduce marks, blemishes and dark spots too. 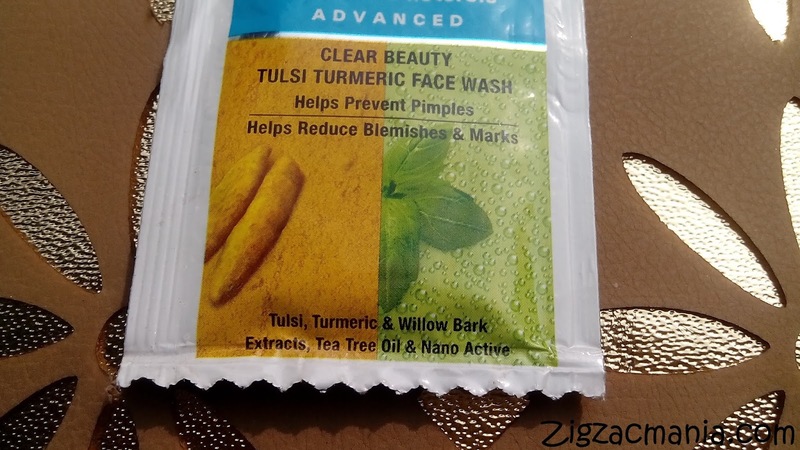 It is enriched with the natural goodness of Tulsi, Turmeric, Brahmi, Willow Bark Extracts and Tea Tree Oil which help fight pimples and blemishes. Directions for use: Squeeze out a small quantity onto your palm. 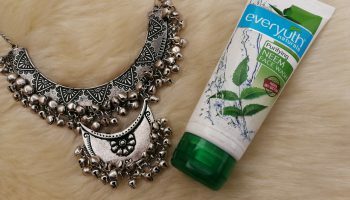 Work up lather and gently massage onto your face. Rinse with water and pat dry. 1. 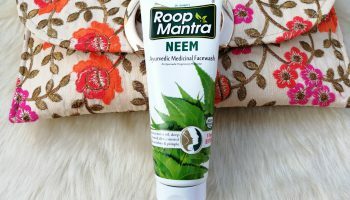 Tube version: The face wash comes in a white, yellow and green colored squeeze tube with images of turmeric and neem, indicating the main ingredients in the face wash. It has a green colored flip top cap which shuts tightly with the base. 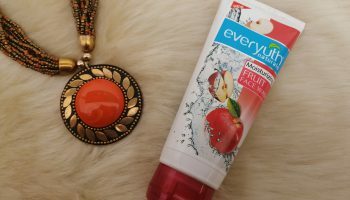 It is spill proof so can be easily carried in the bag or purse. 2. 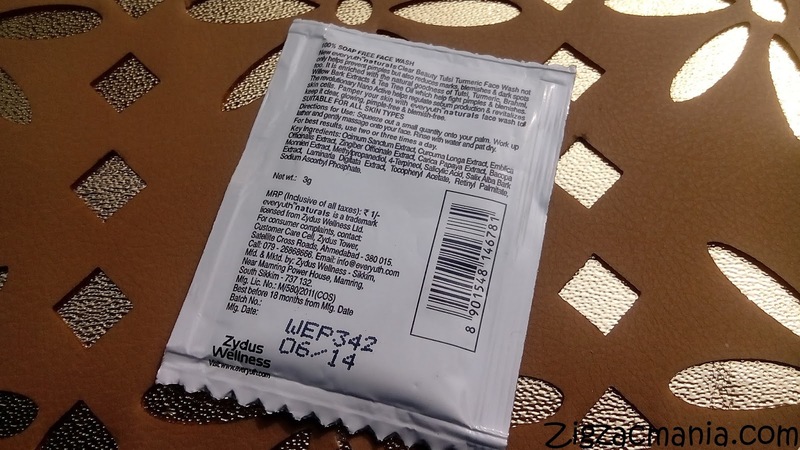 Sachet version: The sachet is also white, yellow and green in color. Required information is provided at the back of the sachet. It very economical & travel friendly. It is very convenient to carry in purse or clutch due to it’s small size during travelling. 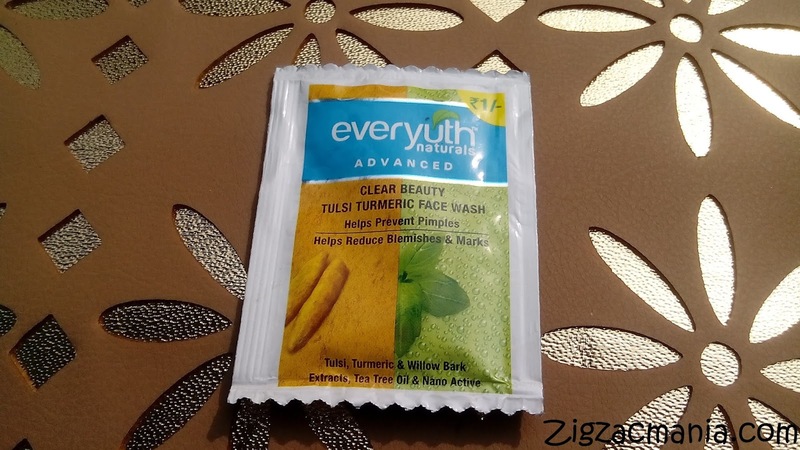 My opinion about this product: The face wash is green in color & has a gel like consistency. It is neither too thick nor runny and is easy to work with. 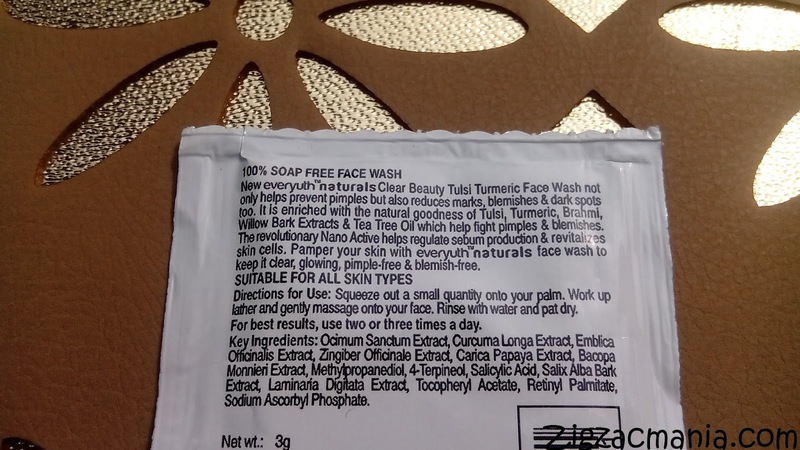 Only a small amount is sufficient enough to build up a lather and clean the face well. It smells like tulsi which is a little strong, so it might irritate people with sensitive nose. This face wash claims to work on pimples, to be honest I don’t think so as I can see pimples popping here & there on my face even I am using the product regularly. 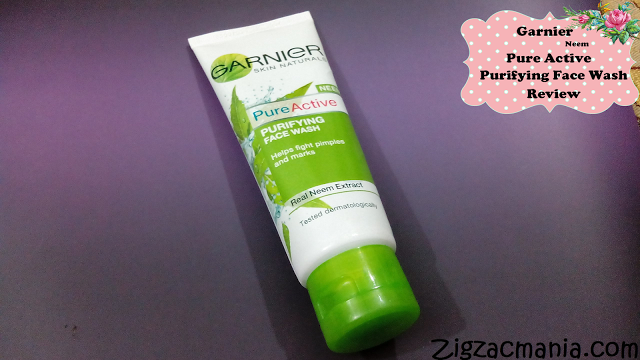 It neither does it stand up to it’s claim to reduce spots & blemishes. After application this face wash doesn’t leave any stretchy or dryness feeling on skin even if you have dry skin, though I need to follow with my regular moisturizer. 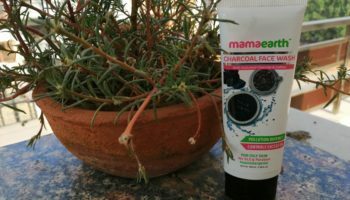 It cleanses the face really well, removes all the oil and dirt and imparts an instant glow to the skin. 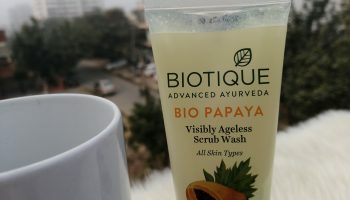 Overall it is an average face wash which is good in cleansing but doesn’t live up to any other claims of preventing pimples but also reducing marks, blemishes and dark spots. 2. Cleanses the face really well. 3. 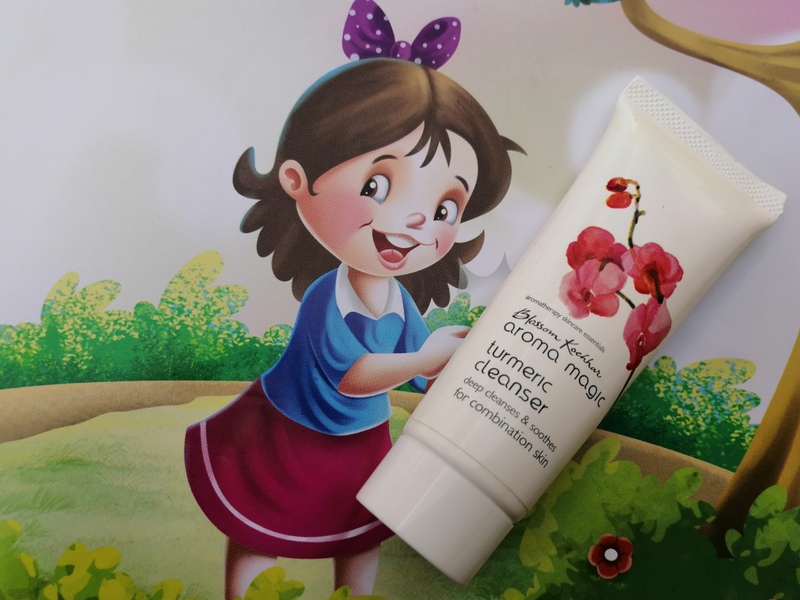 Doesn’t strip moisture off skin. 5. Easily available in the market. 1. 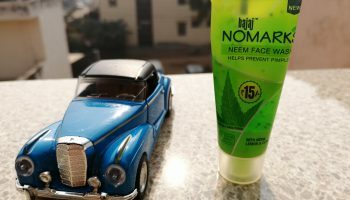 Neither works on pimples, nor reduces blemishes or spots. 3. Has a strong irritating smell. Love your honest review. This is quite a handy dandy option for traveling.